Nowadays, all images are subject to manipulation. Editing, remixing, cropping, recolouring—we can make almost anything appear to be other than what it was. When an image such as a photograph is digitally scanned, then corrected for shadows, shrunk, ‘flipped’ and the people in it made blonde or brunette, then airbrushed; well, by the time that photo appears in the pages of a magazine, or online, it may tell a much different story than the image on which it was based. Nothing need be what it was. Or to put it another way: everything really is what it seems to be, at least in the form you now see it. The bounds of any medium enclose an immediate reality, in which all images, regardless of their pedigrees, may be equally real, relative to one another, and even reinforce one another’s realness. Never mind where the images came from—the issue is where they are now. In a Felix the Cat cartoon, the world is as flat as a magazine page. It is basic black and white, absent of all details but the most necessary; absent almost all shading and even shadow. Felix himself is the simplest of renderings—assembled from a few spheres and sausage-shapes, all black, except for his face. If Felix were to sit facing the viewer, and clasp his hands in front of him, his arms would disappear into the black of his chest. Believe it or not, this makes Felix a delight. His cartoons—mostly silents made between 1919 and 1930, are indisputably crude and yet, because his creators embraced his limitations, shorts such as Felix Doubles for Darwin have a fascinating wit. This is possible because, for Felix, anything can be anything else. And that includes Felix himself. Maybe it’s better to think of Felix as a bunch of shapes, rather than a cat or any other kind of being. It makes more sense that way. For example, unlike a real cat, Felix can detach and reattach his tail whenever he wants to. And the tail would be just as gone if Felix simply wrapped it around himself, because then we couldn’t see it at all. Just shapes against shapes. Felix is soundless, but he does speak. Usually his words appear in word boxes above his head, like in a cartoon strip. 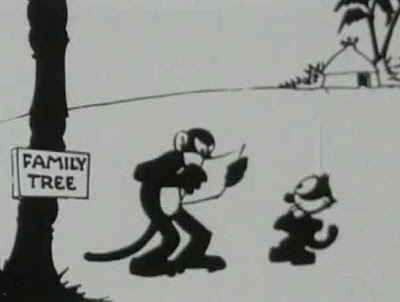 In fact, his short films employ several cartoon ‘standards’; for example, when the cat stares at something, a broken line connects his eye to the object. When he’s shocked, an exclamation mark appears over his head; when he’s curious (which, being a cat, is most of the time), we see a question mark. The fascinating part is that these symbols have as much physical reality as Felix does—in many of his films, he will grab the question mark, etc., and fashion it into a tool, or even climb it as it hovers in mid-air. In Felix Doubles for Darwin, the cat is nearly destroyed by several of these visual red herrings. On a quest in the wilds of South Africa, Felix mistakes the legs of a giant bird for a pair of trees; soon after, a log is revealed to be an elephant’s trunk. The latter reacts badly when Felix scurries up its nose. Felix makes the old man a deal: he’ll go to Africa, investigate monkey society, and bring back proof. Then they’ll split the prize. Of course, if Felix doesn’t have enough money to eat, he doesn’t have enough for a trans-atlantic boat ride, either. His solution is why this Felix cartoon is my favorite of the series, though it's far from the funniest. The cat locates a telegraph station not far from where he and the organ grinder meet. He breaks in and finds the transmitter unmanned. Felix pulls a lever several times, and with each pull, the name of a different destination appears on a screen above him. When it says ‘South Africa,’ Felix taps the Morse key and is sucked into a bulbous microphone. Next we see him travelling through the undersea telegraph cable, looking like a boa constrictor’s lunch. The cable, for the purposes of this gag, is a tube. Indeed, a black tube and a thick cable would look the same in this cartoon. The gag concludes at a South African telegraph station, where a technician receives a ticker-tape message in Morse code. 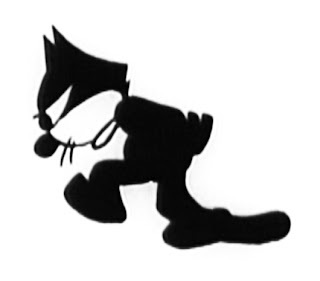 We see the dots and dashes, printed in black; then we see them morph into five letters: ‘F-E-L-I-X.’ The black letters then leave the paper and fuse to form a reconstituted Felix the Cat. Now, I’ve seen some extremes of cartoon physics—the Mickey Mouse shorts of the late-1920s offer several—but this one takes the cake. Felix’s reality absorbs not only regular objects, people and animals, but also comic strip conventions not ‘meant’ to be seen by the characters expressing them; and even, in this case, a sentient cat that is both himself and the abstractions used to represent him. That is, a collection of letters that have the potential to embody, not just reference, what they name. Here's a cartoon worthy of Aristotle. Felix Doubles for Darwin was released a little over a year before the beginning of the Scopes Monkey Trial—meaning it is both extreme farce and topical satire. Just wait and see what the monkeys think of the evolutionary link once the cartoon nears its end. This short, along with nine others, is available on Delta Entertainment’s 2004 DVD release, Felix the Cat—the sound and picture quality of the shorts varies from passable to poor. If you want a look at Felix Doubles for Darwin on its own, you’re better off clicking here (though there is unfortunately no audio), or seeking it out on YouTube. Very unique and unusual blog.I think Felix is very interesting.Love this blog.Thanks for sharing.